Saturday Night Live kicked off its 44th season with a sketch many expected in some form or another: a send-up of the emotionally charged hearings into the sexual assault allegations against Supreme Court nominee Brett Kavanaugh. Among the many politicians portrayed in the opening sketch: Minnesota U.S. Sen. Amy Klobuchar, as played by comedian and SNL alum Rachel Dratch. "We've heard from the alleged victim, but now it's time to hear from the hero, Judge Brett Kavanaugh," said Sen. Chuck Grassley, played by cast member Alex Moffat. In walked a shouting, sniffing Judge Brett Kavanaugh, portrayed by Matt Damon. "I'm gonna start at an 11, I'ma take it to about a 15 real quick!" he yelled. 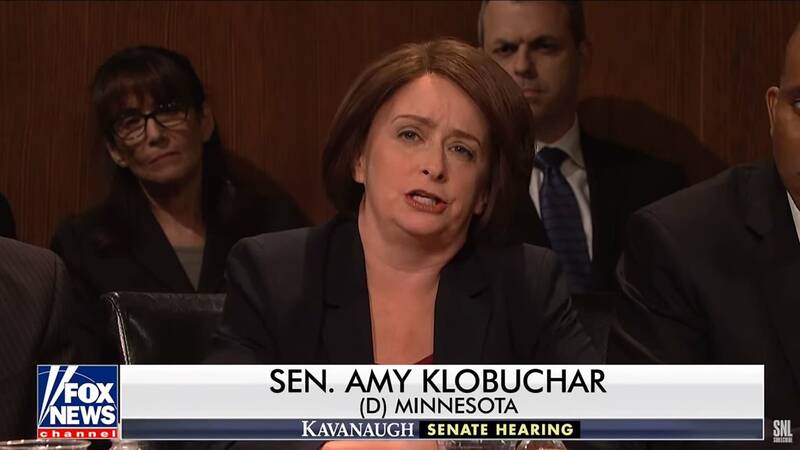 Dratch-as-Klobuchar later appeared, questioning Kavanaugh about his drinking during high school — with the exchange also referencing the real-life pushback by Kavanaugh during Klobuchar's questioning on Thursday, and Kavanaugh's subsequent apology. For her part, the real-life Klobuchar said she liked the portrayal. "You were so good that you even got my daughter to text me on a Saturday night (a first)," Klobuchar tweeted to Dratch after the sketch aired. It wasn't immediately clear whether it was Klobuchar's first time being portrayed on the show. Former U.S. Sen. Al Franken of Minnesota, of course, was a longtime SNL writer and performer. Later in Saturday's season-opening show, Weekend Update had its usual digs at the week in politics, beginning with the Ford and Kavanaugh appearances. "A classic debate of she said, he yelled," as Colin Jost described it.